Kenyan musician Akothee interacts with the hunger-stricken residents of Turkana county. Secular musician Esther Akoth, aka Akothee, has won praises for helping raise more than Sh3 million to assist the people of Turkana county who are facing starvation. With more than a dozen people reported to have died due to hunger linked to drought in the past week, the Give It To Me singer started a pay bill number calling upon her fans and well-wishers to help her feed the hunger-stricken Kenyans. On Friday, Madam Boss, as she prefers calling herself, left for Turkana and put smiles on the faces of the affected victims. 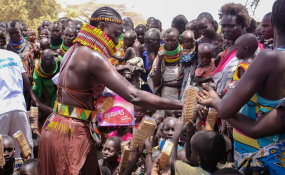 Pictures of the musician, dressed in traditional Turkana outfit, freely mingling with the residents of the hungers stricken resident have since been widely circulated on social media. "In as much as the people need help, they are also vulnerable, my friend you won't bring food here without passing through protocol, the food must be of standard authorized," Akothee said. Akothee's mission also received a big boost from Mombasa Governor Hassan Joho who donated 100 bags of maize. Embakasi East Member of Parliament Babu Owino, also praised the singer for her philanthropy. Akothee should be in charge of everything? Stunts only Madona can pull off! But I still think @akothee @AkotheeKenya did a very noble thing that ought to be emulated by all who are capable. May God bless you.